We can’t answer what your kid will grow up to be like. Or what career they’ll have. But if you want to know how tall they’ll be? Well, get ready for some fun! Unfortunately there’s no scientific proof that ANY of these methods work. But it sure can’t hurt to give them a try! Was your baby on the long side at birth? Or is your toddler looking a bit short compared to their peers? Time to stop guessing and get predicting. Here’s how to tell what height they’re going to be when they grow up. Generally speaking, babies who are very long at birth often end up to be tall adults. However, that’s not to say that super tiny newborns – such as those born prematurely – won’t end up being tall either. And while the parents of a child may not be that tall themselves, they may have family members who are, which can result in their child inheriting those genes. (Even though they didn’t get them themselves). It’s all quite a mystery right? And often children grow at different rates. Comparing the other babies in your mother’s group or kids in the class at preschool, is not a foolproof sign either. So how do you know how tall your child is going to be? Well here are three fun prediction methods to try. This is the quickest way to get a height prediction for your little one. The only catch is that you have to wait until they’re two years old. Or look back at your height chart for when they were that age. Then all you do is double it! For example, 85cm at age two predicts an adult height of 170cm (or 5.57 feet). However… given that girls mature faster than boys, if you have a daughter then you’re better off using this double up formula when she’s 18 months old instead of two. Voila! Example: your height is 5.6 feet (67.2 inches), the father is 6.2 feet (74.4 inches) and you have son. 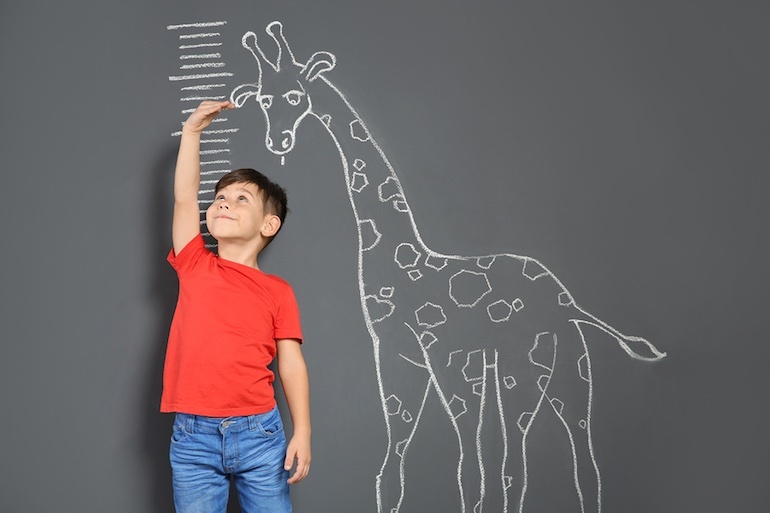 Your child’s predicted adult height therefore is: 6.1 feet (73.3 inches). Of course this only works if you know the height of the genetic parents, which may not always be possible when things like adoption or donor embryos are involved. Lucky last is the growth chart prediction. You know those blue books you get in hospital and have to take to every GP or paediatrician appointment? Well inside are those development charts for things like weight and growth. The doctors track your baby on them to see which percentile they fall into at each check-up. So what you do is go online and access another chart which caters for ages from childhood to adulthood. Such as this one for ages 2-20. 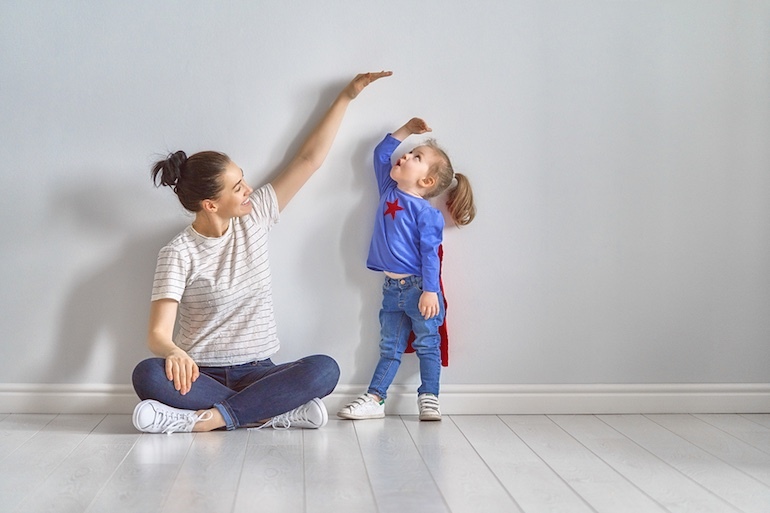 Simply mark your child’s age and height on the chart, and then follow the curve – in the same percentile – to see where they end up at as an adult. Nutrition – Children who are underweight or malnourished can end up shorter. Likewise overweight kids can sometimes be taller than expected. Illness, medications & hormones – Health conditions or chronic illnesses such as cancer, undiagnosed coeliac disease or severe arthritis can result in stunted growth. Unbalanced hormones can also result in shorter or taller heights. And some medications such as regular use of corticosteriods can also cause slow growth. Genetic conditions – Children born with a condition such as Down Syndrome can often be shorter than normal. Other conditions like Marfan Syndrome will result in them being taller. So there you have it. Child height prediction 101! Now you’ll know whether to sign them up for basketball lessons and catwalk modelling. Or whether a career as a jockey or gymnast is looking more likely! In the meantime though, best to still record their height on a chart for a fun keepsake. Wondering about other development factors for your child? Here’s why mums shouldn’t sweat those baby milestones and how to tell if your child is gifted.